I briefly considered hiring a doula for my daughter’s birth. I realized that while in labor, Tim and I might be a little distracted. I thought it would be nice to have someone present who would help oversee that my lengthy birth plan was followed and respected. However, I valued my privacy more than the birth plan. I felt uncomfortable about hiring a stranger to be present at such an intimate, pivotal moment in my life. I even felt hesitant about inviting my own mother. I debated whether or not I should invite my mother until the morning that my water broke. Thankfully, I did invite her. Though she is not a professional doula, she has been present for nearly all of my sister’s births (I believe that’s been about seven that she’s witnessed, as well as the six births that she personally went through). I deeply believe that if my mother wasn’t continually holding my hand and assuring me that I was healthy and doing a good job, I wouldn’t have had the natural birth that I had planned for. I don’t mean to downplay the role that husbands play at birth. My husband never left my side throughout the entire labor. He even laid beside me on the hospital bed when contractions were at their most intense. I know I wouldn’t have had the birth that I wanted without him. But I believe that having someone who is knowledgeable and experienced in childbirth to be continually present for the laboring mother is one of the strongest tools a woman can use to have the lovely birth she desires. In addition to my opinion from my personal experience, I have outlined a list of ten reasons why you should hire a doula for your childbirth. All of the studies I cite I have summarized from The Doula Book by Marshall H. Klaus, M.D., John H. Kennell, M.D., and Phyllis H. Klaus, C.S.W, M.F.T. All of the studies observe first-time mothers that were randomly assigned to groups that would either receive support from a doula or have routine hospital care. Protect birth preferences. A doula is your advocate. Typically a doula will meet with you before your estimated due date to discuss options in childbirth and to understand your preferences. If you are planning to have your baby at a hospital, it will likely be a struggle to keep your idea of a lovely childbirth if it varies from hospital protocol. For instance, despite having gone over my birth preferences with my care provider during several prenatal appointments and despite my husband handing a birth plan to every nurse present during my labor, I was “coached” to push, when I specifically stated that I would like to follow my own natural urges. Also, despite my request that I keep my placenta, it was nearly thrown out. You can make your birth plan very lovely, printed off on delicate paper and scented with rose petals; chances are that no one, except you, your partner, and your doula will actually read it and care about it. Keep in mind that you and your partner will be preoccupied during the intensity of labor and birth and will probably not be physically able to politely remind your doctor/midwife and nurses about all of your preferences. Lower risk of requiring a Cesarean section. Today in the United States, the average rate of a woman requiring a C-section is about one in three. The World Health Organization recommends that this rate “should not be higher than 10-15%.” To further quote the WHO, “caesarean delivery was associated with high maternal and neonatal complication rates and increased health-care costs.” A study was performed in an obstetric unit in Cleveland that showed that “the mothers supported by both their partner and a doula had a cesarean delivery rate of 14.2 percent compared to 22.5 percent in the control group, a highly significant difference.” Perhaps this should be reason enough that you hire a doula, but I said I’d give you 10 reasons. Lower epidural rate. Epidurals, while relatively safe considering that a few decades ago a doctor would offer ether or chloroform, are not risk-free. One side effect associated with getting an epidural is a fever. A fever is also indicative of a very serious, albeit rare, infection. If the mother has a fever, there is no way to differentiate if she is reacting to the epidural or the infection, thus leading to the over-prescribed use of antibiotics for all laboring mothers with a fever. If you have read Dr. Natasha Campbell-McBride’s Gut and Psychology Syndrome, you too will be wary over the use of antibiotics at such an integral time in your baby’s soon-to-develop digestive system. In addition to the antibiotics, the infant is also kept for a longer period of time in the hospital to observe any other signs of infection. Longer period of time in the hospital equals lots and lots of money. Also, longer period of time in the hospital equals longer period of time in the hospital. Another potential adverse effect of routine epidural use is that if the epidural is administered early on in labor, the baby receives a small dosage of the drug. It has been reported that this can cause sluggishness in the newborn, which can disrupt feeding behavior.According to the Cleveland study, mothers with doulas had a lower epidural rate of 67.6 percent; 76.8 percent rate of mothers who didn’t have a doula, a significant difference. Also, in a study performed in a Houston hospital, mothers with doulas that developed a fever in labor was 1%, compared to 10% fever in the no doula group. Shorter length of labor. According to the Houston study, mothers with doulas had an average labor of 7.4 hours while those without doulas had an average labor of 9.4 hours. Shorter labor- need I say more? Lower chance of requiring forceps. While forceps can be a useful tool to avoid a C-section, I think it’s an understatement to say that most expectant mothers would prefer their birth to be forceps-free. Forceps often mean an episiotomy and longer post-birth recovery time for the mother. The use of forceps can also injure the baby ranging from bruises, to facial nerve injury, or in rare cases a broken clavicle. According to the Houston study, the use of forceps in childbirth with the doula assisted mothers was 8 percent; 26 percent for the mothers without a doula. Less need of synthetic oxytocin (Pitocin or Syntocinon). Synthetic oxytocin is often administered in childbirth to shorten the time a mother spends in labor (keep in mind that its use is being reevaluated, as it does shorten labor time, but does not decrease the number of interventions such as C-sections or forceps use, see here). While it’s generally considered to be safe, it is like any drug in that it has a list of known side-effects. One of which being that synthetic oxytocin creates much more intense contractions that are increasingly difficult to endure without an epidural. Other side-effects include nausea and hemorrhaging. Excessive dosage of synthetic oxytocin can lead to brain damage or death in the baby. In the Houston study about 17 percent of mothers in the doula group were given synthetic oxytocin, compared to 44 percent of mothers without doulas. More positive outlook about motherhood. According to the South Africa doula study there were highly significant differences between the doula-supported group and the control group within maternal perceptions of the baby and of self. The Doula group was more likely to believe that their baby cries less than other babies, that their baby is special, easy to manage, clever, beautiful, and that the mother regards baby as a separate, sociable person by 6 weeks. The doula-supported mothers are also more likely to report that they feel close to the baby, pleased to have baby, that they are managing well, that feel they communicate well, that becoming a mother was easy, and that they can look after the baby better than anyone else. Better emotional welfare following the birth. The South Africa doula study observed that mothers who had the support of a doula were less likely to exhibit signs of anxiety and depression and more likely to show higher levels of self esteem following the birth. Stronger relationship with partner. The South Africa doula study also asked mothers about their feelings regarding their partners. 85 percent of the mothers who were assisted by doulas reported that they were satisfied with their partner since the baby was born, only 49 percent of the women without doulas felt this way. 71 percent of the doula-assisted mothers reported that their relationship with their partner was better right after birth, while only 30 percent of the control-group mothers reported the same. 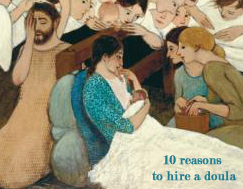 While I understand that the studies I have cited may have flaws, I believe that the 10 reasons I have listed to hire a doula are true. Having a knowledgeable lady stay with you for the entirety of your labor and birth will greatly influence you to stay positive and to keep your confidence about your strength, your body, and your baby. To find a doula in your area, check out DONA International. If finances are an issue, consider a doula-in-training. Click here to learn more about doulas from a humorous radio interview. Categories: Childbirth | Tags: Childbirth, doula, Natural Birth | Permalink. You are absolutely right in everything you say – doulas are wonderful to have at a birth – especially if in a hospital setting she will make sure your voice is heard. And a birth plan, is a must! My HypnoBirthing instructor said that we should give as much thought into planning childbirth as we do for our own weddings. It should be just as beautiful and meaningful a day. Perhaps you could equate the role of a doula to the role of a wedding planner. Wedding planners are not vital to a successful wedding, though they certainly ease the stress of the day allowing you to enjoy each moment. I agree that a birth plan is a must, as getting educated on all options available during childbirth is a must. your hypnobirthing instructor is correct! The birth of a child is also the birth of a mother. It’s a shape shifting event, where we enter into the core of our realities and come back transformed and redefined. It is so important that birth be looked at as spiritual event in a woman’s life and the role of a doula is to hold her hand during this transition. Yay! Thanks for this post! I agree that my husband was essential. And so were the women I invited to support me. I needed them for different reasons. My doulas could teach my husband what to do (how to touch my back with a feather-light touch he NEVER would have figured out on his own, for instance!) and they could reassure me that all was well. If my husband told me, “Everything’s fine,” I would be like, “And just how do YOU know?” I wrote a series of posts about the less-traditional reasons to hire a doula. http://wp.me/p14IqD-2p There are SOOO many reasons that doulas are a great idea! I love your comment birthmuse! It’s hard for a spouse who wants to offer words of comfort, though the laboring woman is sensitive to the fact that he does not REALLY know how she is doing. I watched several silent HypnoBirthing mamas give birth on video, so when I felt the urge to be vocal throughout my labor I felt like something was wrong until my mom told me how my sister made the same noises and how it made her feel so much better. Knowledgeable ladies to offer continual support in the birth room is a must have, especially for first time moms who want a natural birth. What were your plans for the placenta? Out of curiosity? Good post. I should really look into this HypnoBirthing of which you speak. I encapsulated my placenta! To eat in pills! Because I’m crazy! There is a little bit of research out that suggests that eating your placenta helps to balance your hormones and thus help with energy levels and the baby blues. The research isn’t great and can certainly be debated, perhaps it’s more of a placebo than anything, but I decided to give it a try. I wasn’t vigilant in taking my pills, but I felt pretty ship-shape. And so my pills wait in the freezer for the next time I feel hormonal.